loving. living. small. | live small with style: design cycle/r a brand new series on loving. living. small. a brand new series on loving. living. small. I am excited to share a new series that I am starting on loving. living. small. called DESIGN CYCLE/r. Oh la la - this is a good one and I think all of us can relate. 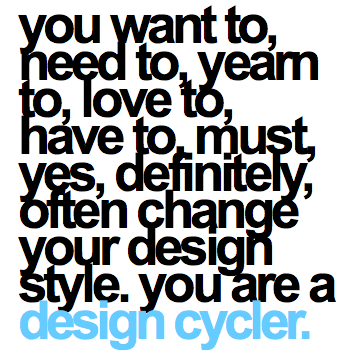 Most of us do what I call "design cycle". A design cycle/r is someone who pretty much has to, wants to, needs to change some design element in their home. The word CYCLE works in terms of a physical item and in terms of time. You set up your home, feel great inside, and then want to change something. Whether it's moving a vase from this table to that table, flip flopping an entire layout of a room, spring cleaning your wardrobe, reorganizing your refrigerator shelves, re/designing your space provides an opportunity to *feel* in control and *feel* in good spirits with you home and your self. Yes! Click here to read one of my own personal design cycles and what spurred it. And check back in next week for a new design cycle/r post that is all about becoming fashion forward in mind, body and soul. Oh and want to join the DESIGN CYCLE/r community?? (OK join me and many other people who are fessing up, admitting, confessing, sharing their own design cycler-ness. Click here to join our brand spanking new facebook community - the hub of our design cycler style. Click here to follow DESIGN CYCLE/r on twitter and join the crew. You are not alone. totally guilty of this. excited about the series! Fabulous idea Beck. Can't wait to get inspired and 'cycling! Hi my name is Tamra and I am a design cycler. ladies, I hear ya! I am 100% a design cycler.